Researching your order is essential. Going to a Thai food stall can be a bit disorienting. They are loud, often in busy areas, and sometimes near heavy traffic. Furthermore, this is where locals go on their limited lunch breaks, so they are in no mood for dealing with clueless tourists. Many of us have experience with thai food in stable restaurant settings at home, but this is a different ball game. You could probably order western standard Pad Thai (fried noodles) at any stall, but if you’re looking to try new dishes, you should know what they are. 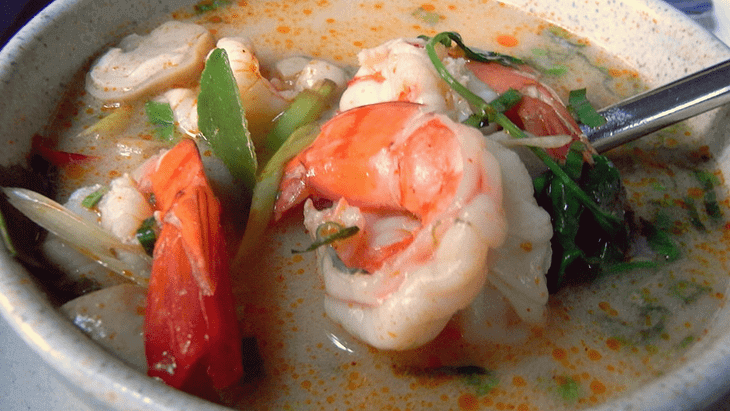 Some other local specialties are the fragrant Tom Yung Goong (shrimp soup), and refreshing Som Tum (Green Papaya Salad). Menus are rarely in english so knowing what the dishes are ahead of time, saves everyone time. A useful trick is to write down names and descriptions of common dishes (or print out this list). That way when you see an item you want to try on the menu, you can simply point to your list. Use your fingers to describe how many portions you want, and wait for the magic to happen. Visual cues are the best way to make sure you get what you want and keep the line moving. The best way to be satisfied with your food stall meal is to have an exact place and dish in mind. 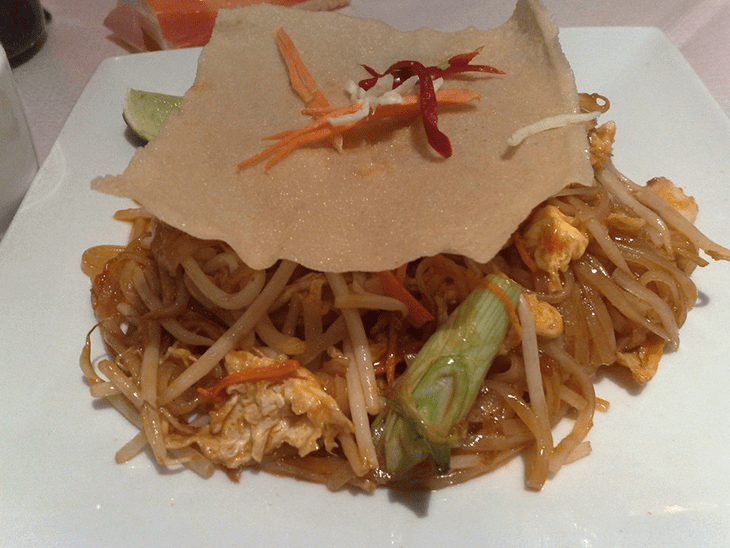 For example, Thip Samai in Bangkok’s old city is known to have the best Pad Thai. Serving the dish for over 50 years gives them the upper hand in the ever changing world of street vendors. If the queue is too long, the old city (Rattanakosin) is bursting with undiscovered options with all the same flavor. 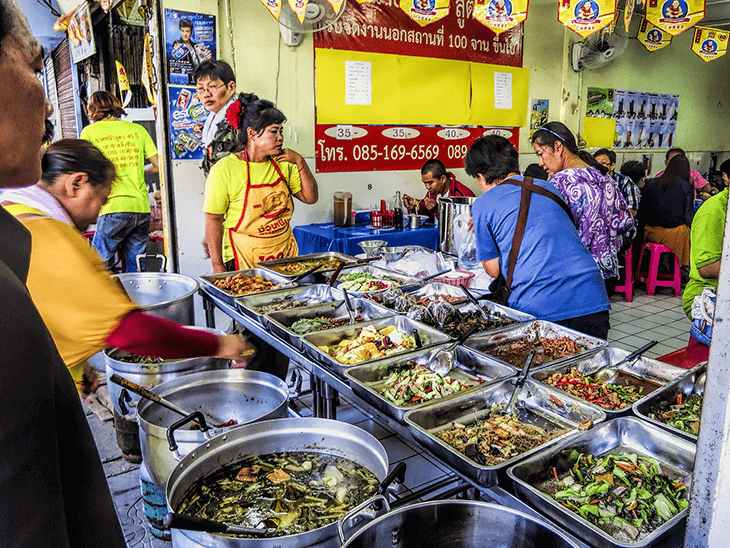 The nearby neighborhood of Khao San is also famous for it’s rampant street food culture (although the government has declared it next on its hit list). This is the place for cheap eats and after-hours binges. Late at night, patrons from the adjacent bars spill out into the stalls to refuel. These are some of the most famous stalls in Bangkok and have a reputation for decent quality at a reasonable rate. Likewise, Bangkok’s Chinatown (Yaowarat Road in particular) is also scheduled for a cleanup. That would be a culinary disaster as the district offers truly delectable cross-cultural dishes. For a simple, yet elegant snack stop by Yaowarat Toasted bread. The line is long but these little condensed milk-stuffed toasties more than make up for the wait. Try the peppered Singaporean style stew Kway Chap Auan Pochana, or try to find a spot at the always packed T&K Seafood. While it may be a bit strange to eat decadent seafood on the roadside, it’s not, as you will find tons of local people waiting for the privilege. For a quick bit of broth grab a Bird’s Nest at Xing Li. This tasty soup is affordable, delicious and served hot or cold depending on your preference (or the weather). Knowing where to go doesn’t end with the names of the stalls you want to visit and what to order. You have to figure out how to get there. To do that it’s best to plan ahead. Get a detailed map of the area you want to visit. Once you know where you want to go, ask your hotel concierge, or show a local the name and hope they point you in the right direction. If you’re looking for something specific, and you should be, once you get lost it won’t be easy to resist other options. 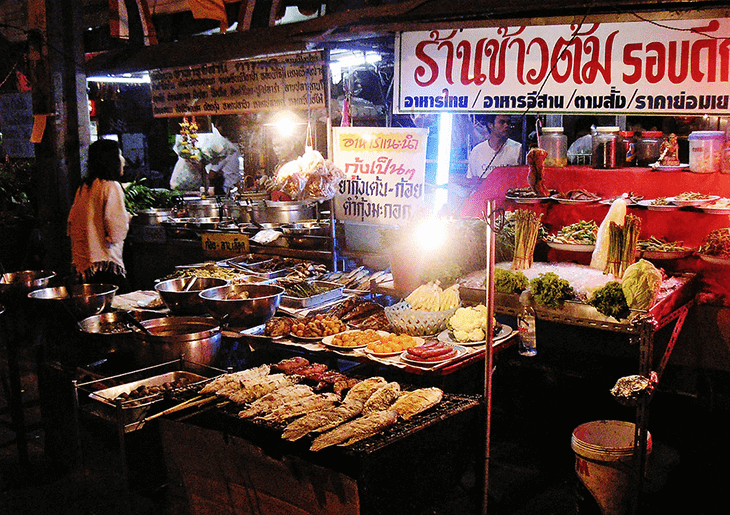 If you’re a picky eater, or someone with serious dietary requirements, Bangkok street food might not be for you. Food Stalls are a close quarters affair. There all ingredients mix together into the delicious mish-mash of Thai cuisine. However, there’s no guarantee that a little pork doesn’t mix with some of the chicken. Or that a peanut from the Pad Thai doesn’t skip into the Tom Yum. If you have serious food allergies, it’s not worth the risk. Also, for followers of strict preparatory regimes like Kosher or Halal, there’s no telling whether your dish will be held in violation. The lactose intolerant, staunch vegans, and true vegetarians should look indoors for a more controlled and less hectic cooking/service environment. Bangkok street food is spicy. There’s no two ways about it. What they consider mild could melt the tongues of inexperienced diners. Even true veterans of heat have been left defeated by Thai food’s stunning penchant for spice. While these flavors certainly add to the complexity of dishes such as Pad Thai, or Som Tum, they are not essential. So unless you’re truly ready to brave the inferno, best keep it mild. If they ask if you like it spicy, err on the side of caution the first few times. If you’re not a fan of spice at all, there are still delicacies to be found. Khao Phat is traditional fried rice we can all get behind. You can beef it up (literally) by ordering Khao Phat Nua or add a delightful touch of protein with a fried egg (Khao Phat Kai). The similar Khao Kai Jiew features a bed of fluffy jasmine rice topped with a simple omelette. Meat and seafood lovers can add minced pork (Khao Kai Jiew Mhoo Sup) or shrimp (Khao Kai Jiew Goong Sup) for a more filling dish. Noodle lovers don’t give up hope. There is still Phat Si-Io (also spelled Pad See-Ew). These wider, fatter noodles are cooked with a dark soy sauce that helps cut down the spice. Food stalls usually serve this local speciality with condiments on the side. That means you can decide how spicy you want it. Thai people have a reputation for being extremely hospitable and friendly. It’s not an undeserved cliche. 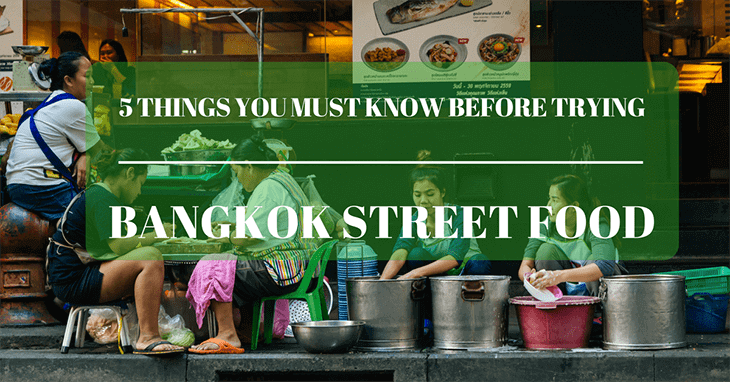 If you’re generally interested in an aspect of Bangkok street food, go ahead and ask. However, you must manage your expectations, a busy restaurateur does not have time to list every ingredient in their dishes. Sometimes there will be no time for an answer, or the answer will be no, but that doesn’t mean you shouldn’t ask. If you’re on the fence about trying Bangkok street food, but are looking for a bit more guidance. Consider taking a street food tour. Small tours are always snaking thorugh Bangkok’s many markets, and joining one is, in no fashion, a sign of defeat. This way, you have a paid guide who’s sole job is to answer all your pesky questions. While obviously more expensive than a normal, autonomous experience, a street food tour will give you the opportunity to try many new dishes and meet new people. Your guide will be fluent in English and Thai, so he or she can explain every plate and ease any fears you might have. With a little foresight, research, or help from a local guide, Bangkok street food is a one-off culinary experience. Best to try it now, as if current trends continue, you may miss out on a once in a lifetime cultural encounter.